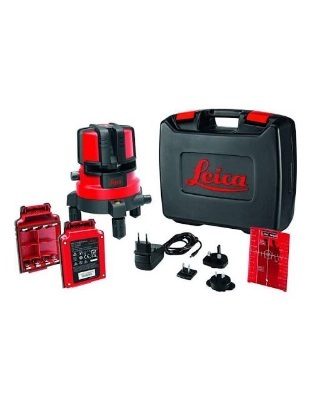 The Leica Lino L4P1 Point and Cross Line Laser 834838 offers the benefits of a line and plumb laser. It provides a working range of up to 50’ with leveling and plumb point accuracy at ±1/16” @ 30’. When used with a receiver, the laser beam has an extended range and can reach up to 164’. It also has a laser plumb point to help increase precision. Self-Leveling: The Leica Lino L4P1 automatically compensates for any misalignment within ±3°s. If the angle is further out of level, the instrument prevents the laser point from being projected to avoid errors. Long Battery Life: long lasting, rechargeable, Li-Ion battery pack. From a single charge, you can use the laser for up to 24 continuous hours. Smart Power: Comes with a separate battery plate for you to use 4 standard, alkaline AA batteries. This way you can still use the laser while the battery recharges. Precise Layout: full 360° mobility base. This allows you to set up your laser plumb over a specific point and not have to move it, regardless of the direction that you need the beams. Easy-to-use fine adjustment knob. This allows you to move the vertical lines in super small increments, providing higher accuracy. Charger and a variety of plugs.